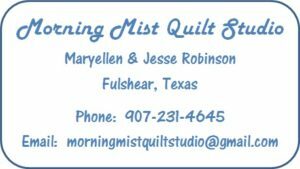 Thank you for choosing Morning Mist Quilt Studio as your quilting partner! We truly appreciate your business, and we want to work together to complete your work of art to your satisfaction. Please follow these guidelines for preparing your quilt top for quilting. If you have any questions or concerns, please bring them to our attention. DO NOT make a quilt sandwich! The top, batting, and back should be brought to us in three separate pieces. Do not layer, baste, or pin the layers together. DO NOT add embellishments before quilting! Dimensional embellishments, like buttons and beads, will interfere with the sewing foot, which may cause damage to your quilt or the equipment. Are all the seams secured? Make sure all the seams are secure to the edges. Seams that come unsewn can weaken the integrity of your quilt. Also, the sewing foot can catch in open seams, causing damage to your quilt or machine. Are the thread ends trimmed? Trim and remove sewing threads, fraying threads, and loose threads. Stray threads can show through the finished quilt and detract from the beauty of your finished quilt. Is your quilt top pressed so the seams are flat? Flat seams are very important and can make a big difference in the final look of your quilt. Iron from the front and the back, and if you use starch or sizing it will be easier to handle and quilt. Is your quilt back big enough? Your quilt back must be 4 inches bigger than your quilt top on all four sides. That means a total of 8 inches longer and 8 inches wider than the top. Is your back pieced? If you piece your back, which is most often the case, make sure to trim the selvages off. Selvages are difficult to sew through, and will shrink unevenly when you wash the quilt, which creates a puckered line. When piecing the back, use a ½ inch seam and press the seam open. This will minimize the bulk in one area as the quilt back is rolled on the frame. Is your quilt back square? Square up your quilt back. If the ends are not square (i.e., straight across), we will have to square it up before we can attach it to the frame. Is the back pressed? Press the back. Using starch or sizing makes it easier to handle. Your batting or ours? You do not have to provide your own batting. We have several types of quality batting available at reasonable prices. If you provide your own batting, it should be 4 inches bigger than your quilt top on all four sides. That means a total of 8 inches longer and 8 inches wider than the top, just like the back. Which end is up? Please identify the top end of both your quilt top and back with a paper label secured with a safety pin. We want to make sure the quilting is going in the right direction! Print these guidelines with a checklist, and measuring worksheet.